Kameron Williams has written a novel about the world before the moon shone in the night sky. The Time Before The Moon is the story of Omi, who, at first, seems like any of a dozen other boys. He seeks the best flint for his spear, he dutifully goes to the village Seer to receive enlightenment, he tries to woo the girl of his dreams, and he goes hunting with his friends. Then one day he begins to doubt the leadership and teachings of the Seer and secretly questions the Seer’s supposed connection to the gods. But to question the Seer is to risk being “cleansed”, a fate worse than death. When a cruel rival crushes his most prized hope, Omi flees into the wild, leaving behind everything and everyone dear to him in search of freedom. But will he find it? 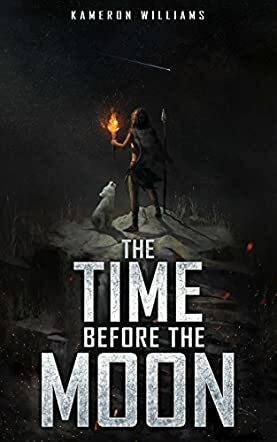 Kameron Williams’ The Time Before The Moon has an authenticity to it. This shows in the descriptions of the labor intensive processes the characters use for creating their homes and weapons. The culture of The Time Before The Moon is the Stone Age. The characters possess nothing that they have not crafted themselves. If they are going to eat, they must hunt for their food and plan for the future. The author describes all of this in fascinating detail, but has also written a compelling story with characters that readers care about. We experience Omi’s curiosity, love, hunger, and intensity first hand, and we yearn to find out if he and the others will find what they seek: freedom from rules and traditions that have no real worth. The Time Before The Moon comes highly recommended.